Rebel Records has signed Mark Kuykendall, Bobby Hicks & Asheville Bluegrass to its roster. 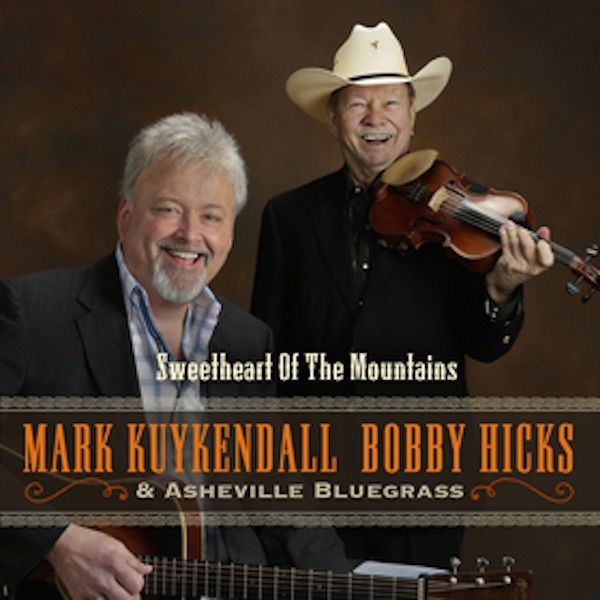 “Sweetheart of the Mountains” is the first track off of Mark and Bobby’s debut album for Rebel. The album called, “Down Memory Lane” (REB-1855) is scheduled for release on CD and digital formats from the 6th. The single is available now through iTunes, Amazon and other select online music stores. We are so honoured to have Mark Kuykendall, Bobby Hicks & Asheville Bluegrass join our stable of artists. Together, Mark and Bobby bring nearly a hundred years of experience to this album. Mark is a wonderful multi-instrumentalist and a top-notch traditional bluegrass singer and songwriter. Bobby – what more can be said about Bobby? His face will be forever etched on the Mt. Rushmore of fiddle players – Mark Freeman, Rebel Records President. The official title of the band is Mark Kuykendall, Bobby Hicks & Asheville Bluegrass. The inclusion of Hicks on this recording was an easy decision. Hicks, now in his 80s and playing as strong as ever, is a highly respected bluegrass fiddler who started working with Bill Monroe in 1954. He would later go on to play for Ricky Skaggs & Kentucky Thunder for 22 years, performing on Skaggs’ most successful recordings and winning 10 Grammy Awards along the way. What Kuykendall and Hicks share is a love for bluegrass music and a deep affection for western North Carolina. Hicks was the North Carolina Fiddle Champion when he was 11 years old and just last year was the recipient of the prestigious North Carolina Heritage Award. He has also been inducted into both the North American and World Fiddlers Hall of Fame. The remainder of the band includes Nick Chandler on mandolin and baritone vocals, Nick Dauphinais on bass and tenor vocals and Seth Rhinehart on banjo. Kuykendall wrote five of the songs on Down Memory Lane, most of which were written earlier in his life and now have been resurrected. I wrote ‘Sweetheart of the Mountains’ when I was in my early teens about a former girlfriend. As for the rest of the songs, I hadn’t sung them in over 20 years. I wrote them when I was with Monroe, and I would get his mandolin and go to the back of the bus to work them out – Mark Kuykendall. Apart from Kuykendall’s strong vocal, the track features a dynamic twin fiddle break that epitomises the hard-edged traditional style that both men clearly absorbed from working as members of Bill Monroe’s Blue Grass Boys. For those who will be attending IBMA’s World of Bluegrass, Mark Kuykendall, Bobby Hicks & Asheville Bluegrass will be performing there at the Wide Open Bluegrass Festival on 3rd October.